Marc Bamuthi Joseph discusses his multi-disciplinary performance piece /peh-LO-tah/ – a futbol framed freedom suite… that recounts personal stories of playing soccer mixed with social commentaries about the business of the sport. /peh-LO-tah/ will be presented by the MCA in association with the Chicago Humanities Festival October 5 – 8, at the MCA Stage. Tickets for the performances are $30 and are available at the MCA Box Office at 312.397.4010 or www.mcachicago.org. 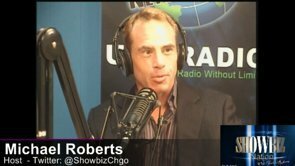 Showbiz Nation LIVE! Interview with Playwright/Poet/Performer MARC BAMUTHI JOSEPH from SHOWBIZ NATION LIVE! on Vimeo. Marc Bamuthi Joseph is a spoken word poet, dancer, and playwright and a recipient of the United States Artists Rockefeller Fellowship. He is also the winner of the 2011 Alpert Award in Theater, and an inaugural recipient of the Doris Duke Performing Artist Award. He has served as an advisor and panelist for the Rockefeller MAP Fund, the PEW Charitable Trust, and the Zellerbach Family Fund. Joseph is the founding program director of the non-profit Youth Speaks, and is a co-founder of Life is Living, a national series of festivals activating under-served areas through hip-hop and environmental action. Joseph recently premiered the Creative Time commission “Black Joy in the Hour of Chaos” in Central Park, New York, and is currently Chief of Program and Pedagogy at the Yerba Buena Center for the Arts in San Francisco. Inspired by Joseph’s first trip to South Africa, when the nation was preparing for the 2010 World Cup, the performance shows how soccer – a source of joy and physical freedom for so many – is also a means of corruption and inequality. Through spoken word poems, live music, and video projections, with choreography inspired by soccer movements and techniques, /peh-LO-tah/ explores the political, economic, and social significance of ‘the beautiful game.’ Presented by the MCA in association with the Chicago Humanities Festival, /peh-LO-tah/ takes place Thursday through Sunday, October 5 to 8, at the MCA Stage. At the core of the work is Joseph’s storytelling, recalling his first memories of playing the sport barefoot in New York City and then his travels to soccer capitals around the world. Making stops in South Africa, Brazil, Europe, and the US, Joseph witnessed different infrastructures and government investment in the game depending on factors such as economic and political stability. Named after ‘pelota’ or the Spanish-language word for ball, /peh-LO-tah/ magnifies how global economies operate on a local and personal scale, affecting how bodies are conditioned and perceived. Along with spoken word poetry by Joseph, /peh-LO-tah/ features interdisciplinary performances by Amara Tabor-Smith and native Chicagoan Traci Tolmaire as well as original music by Tommy Soulati Shepherd with selected vocal arrangements by Yaw Agyeman of the Black Monks of Mississippi. 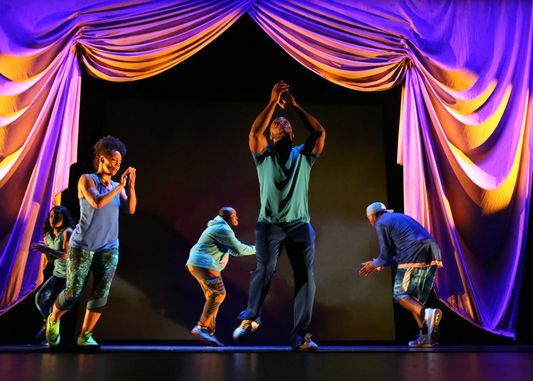 Set against a backdrop of projected video footage from Joseph’s travels, the dynamic staging includes folkloric dances of South Africa and Brazil fused with elements of soccer, modern dance, and hip-hop. Shadow animation designed by TED Fellow Christina Marie creates dramatic silhouettes that amplify the dancers’ bodies, using physicality to express central themes. Shepherd fuses music styles from around the world, borrowing signature elements from gospel, hip-hop, bossa nova, and Brazilian carnival music. Performed live, the eclectic soundtrack celebrates the world’s shared interest in soccer and how it brings people of different nations and beliefs together. Director Michael John Garcés’ previous work with the Living Word Project includes directing red, black and GREEN: (a blues) and the break/s. As the Artistic Director of Cornerstone Theater Company in Los Angeles, Garcés’ credits include Urban Rez by Larissa FastHorse; California: The Tempest by Alison Carey; and Plumas Negras by Juliette Carrillo, in addition to writing Magic Fruit and Los Illegals. Other recent directing credits include Wrestling Jerusalem by Aaron Davidman; District Merchants by Aaron Posner; and The Box by Sarah Shourd. He is a company member at Woolly Mammoth Theater Company in Washington DC, where he worked on Lights Rise on Grace by Chad Bekim and The Convert by Danai Gurira. Garcés is the recipient of the Princess Grace Statue and the Alan Schneider Director Award. Composer and performer Tommy Shepherd is an actor, playwright, musician, educator and a co-founder of Felonious, a resident company at Intersection for the Arts, San Francisco. Shepherd is a member of Parent’s Choice award-winning educational hip-hop group Alphabet Rockers, as well as California-based performance groups Campo Santo and Antique Naked Soul. Shepherd has performed and toured internationally with Marc Bamuthi Joseph, collaborating on Scourge, the break/s, Spoken World, and red, black and GREEN: (a blues). /peh-LO-tah/ runs 90 minutes and takes place at 7:30 pm each night, Thursday-Saturday, October 5-7; with a 2 pm show on Sunday, October 8. Tickets for the performances are $30 and are available at the MCA Box Office at 312.397.4010 or www.mcachicago.org.